Written by Michael Evans on April 16th, 2019 . 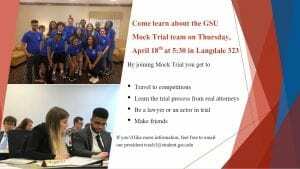 Interested in joining our award winning Mock Trial team in fall? Then attend this info session! Written by Michael Evans on April 16th, 2019 April 16th, 2019 . Written by Michael Evans on January 2nd, 2019 . This is a great opportunity to meet law school representatives from across the country. The event is free of charge and you do not need a reservation. Just make sure to bring your GSU Panther ID card. If you have any questions, contact Susan Belmonte at sbelmonte@gatech.edu. Written by Michael Evans on December 31st, 2018 January 3rd, 2019 . Written by Michael Evans on December 20th, 2018 December 20th, 2018 . Written by Michael Evans on December 3rd, 2018 December 17th, 2018 . The Pre-Law Society and CASA are co-hosting two upcoming panel discussions (on October 24 and November 7) featuring a wide diversity of lawyers. Both events will be in Aderhold Room 404 at 12:30pm. Since space is limited, you need to reserve a spot ahead of time by sending an email to chrisbrown@gsu.edu.